Today’s recipe is fit for royalty! This cake was served in the palaces of the ancient Mesopotamian city of Ur and uses one of the most important food staples in ancient Mesopotamia—the date. Ur was located in what is now Iraq and was an important city on the Persian Gulf. It was inhabited from 3800 BCE to 450 BCE. Due to its position on the gulf, Ur became an enormous and hugely influential city trading with countries as far away as India. 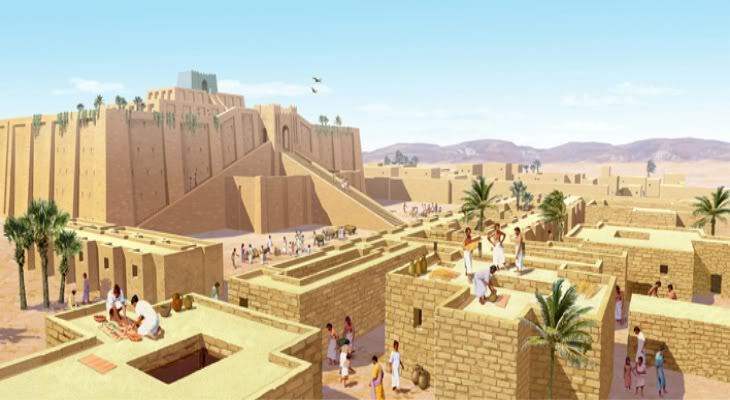 Its citizens were wealthy and lived unusually comfortable lives compared with those in other Mesopotamian cities. The date was central to the diet in ancient Mesopotamia. The fruits of the date palm were extremely important because they supplied much needed nutrients including fruit sugars and iron. The dates were easy to store and traveled well in the hot and arid climate. Ancient Mesopotamians were said to have eaten up to six pounds of dates per day. 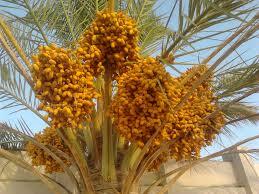 Every part of the date palm was used. The leaves could be woven into baskets, hats, carpets and even roofs for desert huts while the timber from the trunk was used in the construction of homes and furniture. Eventually, traders spread the tasty fruit around the world and today it is enjoyed by many different cultures. Records from the city of Ur describe the palace cakes as being made from “1 sila of butter, 1/3 sila of white cheese, 3 sila of first-quality dates, and 1/3 sila of raisins.” A sila equaled a little more than three cups. The recipe below has been scaled back so the amounts of the ingredients are more manageable. You’ll notice it also includes several more ingredients not in the original Ur recipe. Treat yourself royally and enjoy this rich, indulgent and fruity ancient dessert! *Recipe courtesy of “Cooking in Ancient Civilizations” by Cathy Kaufman. Preheat the oven to 325 degrees F. Combine the dates, raisins and spice and scatter in a 10-inch cake pan. Press the cottage cheese through a strainer to break up the curds. Combine the cheese with the melted butter, eggs and milk and slowly stir into the flour, moistening thoroughly. Pour the batter over the dried fruits and bake for 45-55 minutes, or until a toothpick inserted into the centers comes out clean. *Note: The dried fruit will stick to the bottom of the pan. Line the pan with parchment paper or grape leaves for a more authentically ancient feel. Kaufman, C. K. (2006). Cooking in ancient civilizations. Westport, Conn.: Greenwood Press. This entry was posted in Blog, Bon Appetit Wednesday, Culinary, Culture and tagged ancient history, ancient recipes, AntiquityNOW, Bon Appetit Wednesday, date palm, Mesopotamia, palace cakes, Ur. Bookmark the permalink. Wow! This tasted amazing! Made it for a school project and got 50/50 on it! Also very yummy and tasty! People should try this!